Prime Minister Abiy Ahmed disclosed today that he has picked Cardinal Berhaneyesus, head of the Ethiopian Catholic Church, as convener of Truth and Reconciliation Commission. Yetnebersh Nigussie, rights activist, is named as deputy Chairman of the Commission. It was disclosed when Abiy Ahmed and his deputy, Demeke Mekonen, met with members of the Commission in the office of the prime minister today. 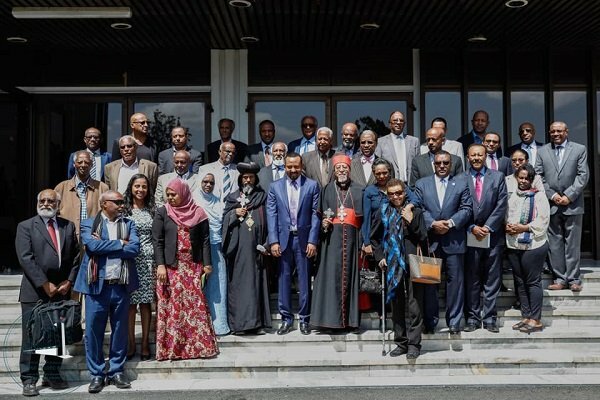 Abiy called on members of the Commission to work towards ensuring durable national unity and create a system that could be an example to other countries as well. While assuring members that government will not intervene in the works of the commission, he said that government will support it including in the arrangement of office space. As well, he told members of the commission that they need to work free from ethnic and religious affiliations, and partiality. The Ethiopian Parliament named members of the commission on February 5, 2019 and they are 41 in numbers. Radicalized ethnic politics has created not just political polarization but also security problems in the country so much so that millions of Ethiopians are now identified as internally displaced people.